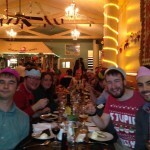 This year the TuttleLab celebrated their Christmas in Greek style at Zorba. Secret Santa provided a number of interesting surprises and, as always, guaranteed plenty of laughs. The night was topped off by music and dancing courtesy of our hosts for the evening. Here’s wishing everyone a Merry Christmas and a happy 2014.